My friend Seth suggested it might be fun to check out what John Zorn has been up to lately, so last night we headed up to the Miller Theatre to catch the premiere of The Prophetic Mysteries of Angels, Witches, and Demons, presented as part of the third and final installment of Miller's "Pocket Concertos" series, wherein composers are commissioned to write something for soloist plus chamber orchestra. Or, you know, whatever. 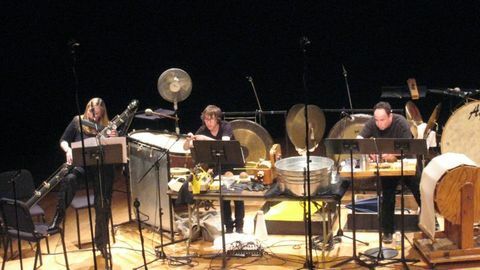 In Zorn's case the "whatever" was the impressive smörgåsbord of percussion you see above (some of it custom-built by Kenny Wollesen and friends), as performed by Alex Lipowski and William Winant. Half the fun of the piece was waiting to see how and when each "instrument" would be used -- the wash basin, the sandboxes, the squeaky door... Zorn knows very well that if in the first act he has hung a pair of umbrellas from a rack, in the third act they must be used. And so they were, in a spirited face-off between the two percussionists. Yeah, it was a lot like John Cage performing "Water Walk" on I've Got A Secret (a deliberate homage? Who knows, Zorn scorns program notes). But it was still a hell of a lot of fun, especially with the additional theatricality of having two percussionists going at it, sometimes in strict synchronization, sometimes in opposition to each other. The drama of an old-school Romantic concerto comes from the epic struggle of a single rugged individualist pitted against Borg-like massed orchestral might. But here, flutist (can't bring myself to type "flautist") Tara Helen O'Connor has an even more difficult challenge -- as the ostensible soloist, she has to compete for attention with a couple of guys spraying seltzer into a glass and cranking the wheel on a homemade wind machine -- when they're not smashing cymbals and thwacking gongs. She's cast as the exasperated straight man, responding to the general onstage ridiculousness with "serious" melodic lines and incisive phrasing. 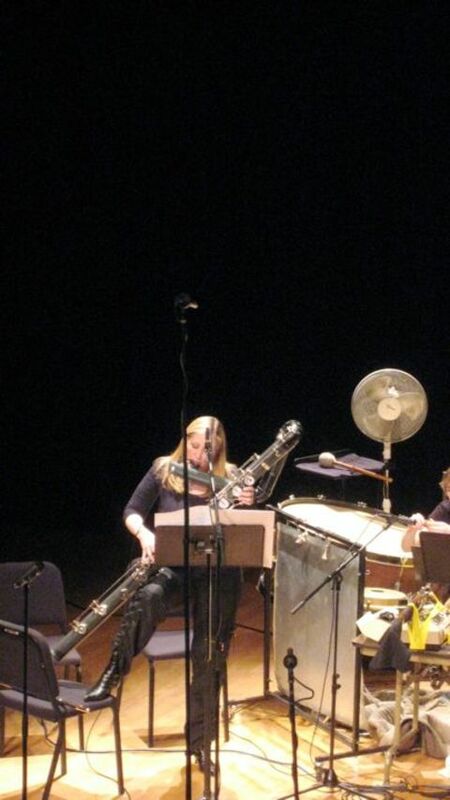 But she also gets the last, and biggest laugh -- in a piece full of sonic slapstick, the only time the audience really lost it was watching O'Connor trying to wrangle the contrabass flute into playing position. The concerto closes with beautiful, otherwordly tones from this inherently absurd instrument. My one (minor) quibble with this bit of high-class ha ha was the inclusion of Ikue Mori on laptop. I mean, I get why Zorn included her -- she often supplied the connective tissue between moments, allowing Lipowski and William time to reposition for the next bit of business. But conceptually, it felt like a bit of a cheat. 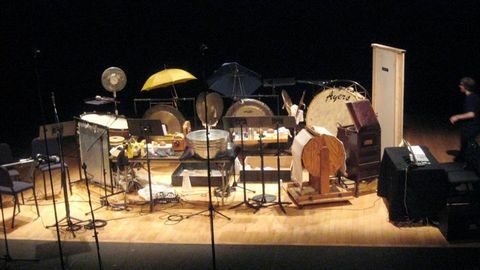 The percussionists were working very hard to generate an array of organic sounds from a all manner of objects, and the effect depends on our being able to see just how they are getting the sounds they are getting. Adding invisibly-generated electronic sounds to the mix drains a bit of magic from the piece. Then again, Matmos does almost exactly the same thing and I love it. Which leads me to suspect I'm being wildly inconsistent on this. If not downright hypocritical. The other pocket concertos on the program were from composers previously unfamiliar to me -- Laura Elise Schwendinger and Ichizo Okashiro. Schwedinger's Chiaroscuro Azzurro featured violinist Jennifer Koh. Okashiro's The Starry Night (named after, yes, that "Starry Night") featured pianist Christopher Taylor. Both found a worthy adversary in the chamber orchestra incarnation of ICE, directed by Jayce Ogren. Everyone played their assess off -- ICE is kind of a band-of-Theseus but they always seem to deliver the goods. I'm afraid I don't have a whole lot to say about these two works, though. Schwendinger's piece was vividly orchestrated -- I am particularly fond of one passage where she elegantly supported Koh with harp, piano, and pizz. strings. But while the opening of each movement was striking and full of promise, I found every time I quickly lost the thread. I heard a succession of well-crafted individual moments, but they didn't really seem to add up to a satisfying musical narrative. Okashiro's The Starry Night was very static and full of expressionist angst. Unremitting, unshakeable angst, all the way through. It's a two-movement work, and while the second movement is more spacious, it's otherwise extremely similar in mood and vocabulary to the first. Pitch-wise, the piece is at the very margins of "extended tonality" -- it has audible key centers and a few yearning , Wagnerian melodies, but the harmonies are packed tight, with lots of precise, stabby clusters in the piano. On the one hand, I applaud Okashiro for trying to reclaim Van Gogh's ubiquitous masterwork from the over-familiarity brought on by being reproduced on millions of coffee mugs, greeting cards, mouse pads, et al. It seems like he's trying to capture in sound the more unsettling aspects of the painting -- and the artist. On the other hand, there are already quite a lot of works from the first half of the 20th century that take a similar approach to depicting both night-time and, well, angst. The concerto was well-crafted and extremely well-played -- Taylor's professorial exactitude at the piano was particularly well-suited to the demands of the part -- but it was also a bit hard to escape the feeling of déja vu. While this is technically the end of Miller's run of Pocket Concerto concerts, we were told the concept would live on, folded into its excellent, ongoing Composer Portraits series -- presumably this means that living composers featured in the series will be commissioned to write a pocket concerto for their Portrait gig. 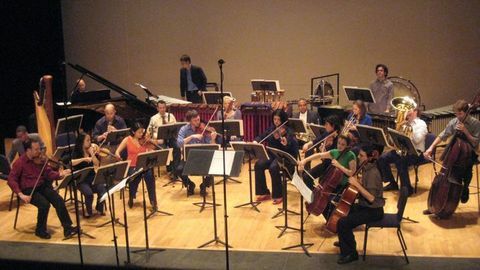 This is a great idea -- I think the good ol' soloist vs. ensemble bout has a lot of possibilities as-yet unexplored, and I'm looking forward to hearing what comes next. Tickets to this event were provided by Miller Theatre. Excellent report -- thanks, Darcy.